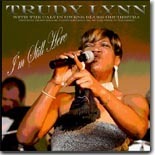 Houston singer Trudy Lynn shows that she can still sing the blues with her latest release, I'm Still Here, on Sawdust Alley Productions. It's this month's Pick Hit. Two CDs, Matt Minglewood's The Story and The JW-Jones Blues Band's Kissing In 29 Days, share the latest honor as the Blues Bytes Surprise hit. The common thread between these discs is that both artists hail from Canada. We Flashback to the early '90s for a great, raucous Mississippi Delta CD from the late Roosevelt "Booba" Barnes, which sadly turned out to be his only solo release. This month's What's New section features new CDs from Willie "Big Eyes" Smith, Nelsen Adelard, Cassandra Wilson, Robin Trower, Sugarcane Collins, Charlie Musselwhite, Carl Sims, Sheba Potts-Wright, Bobby Rush, Calvin Owens, The Mannish Boys, Eric Lindell, and more, plus DVDs of classic 1970s performances from Bonnie Raitt and Teddy Pendergrass.